Sleep in a restored 25-ton caboose at The Red Caboose Motel & Restaurant in Lancaster County, Pennsylvania! When railroad buff Don Denlinger first established the The Red Caboose Motel in 1970, all 19 cabooses were painted red. Since then, The Red Caboose has expanded to include 38 cabooses, a mail car and a baggage car, all decorated in the paint schemes of America's most famous railroads. There are ten floor plans to choose from, sleeping from two to six. The Red Caboose Motel overlooks the Strasburg Rail Road, so you can watch trains go by as you dine in Casey Jones' Restaurant, the on-site restaurant housed in two authentic P70 80-ton Pennsylvania Railroad Coaches. If you are a true train aficionado, right next door is the National Toy Train Museum and around the corner are the Strasburg Rail Road, Choo Choo Barn and the Railroad Museum of Pennsylvania. And, of course, the amazing Dutch Wonderland is just a few miles away! 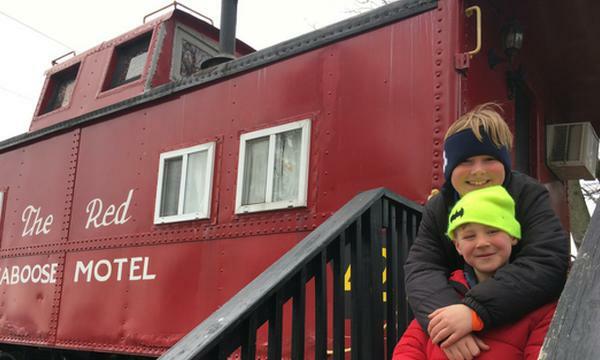 All aboard for family fun - at the Red Caboose Motel! To purchase this $99 deal, you will pay a $15 deposit at check out. The remaining $84 (plus 11% lodging tax) will be paid directly to the Red Caboose Motel when you make your reservation. Valid Now - May 16, 2019. Weekdays are Sunday, Monday, Tuesday, Wednesday & Thursday nights. BLACKOUT DATES: April 21-25, 2019. Lodging is for up to 2 adults and up to 4 children - perfect for families! All cabooses have private bathrooms, heat and air conditioning. Multiple vouchers may be purchased and redeemed together - to extend your stay. Not Valid for Shady Rest Hotel Farmhouse Suites. Expiration: May 16, 2019. Expiration reflects date by which your stay must be completed. Call the Red Caboose Motel at 717-687-5000 to make your reservation. Please mention that you purchased the CertifiKID voucher and provide your 12-digit CertifiKID Voucher Code. You will be charged $93.24/night ($84 + 11% lodging tax), payable by credit card. Multiple vouchers may be purchased and redeemed. Valid only for the dates listed above. Cannot be combined with any other special offers, promotions or discounts. Not valid on prior reservations. Vendor is responsible for the quality of the products or services provided at redemption. Merchant cancellation policy applies.